Today, folks, is a lesson on confidence and how when someone hands you a plate full of opportunity … you should take the darn plate, rather than hiding your stinky self in bed. 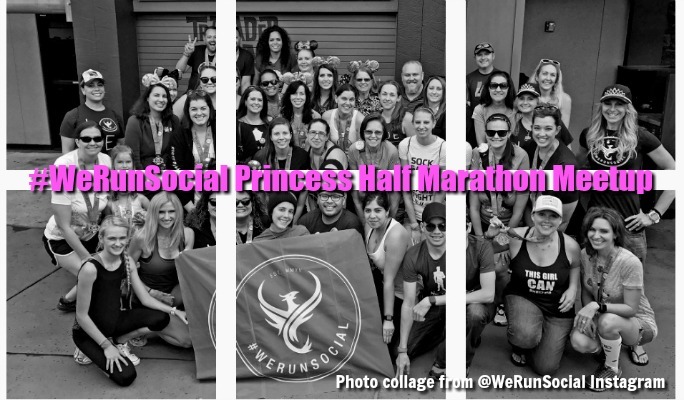 Yes, I’m talking about the 2017 #WeRunSocial Princess Half Marathon Meetup at Disney’s Polynesian resort … the one I came *thisclose* to flaking out on by hiding my stinky self in bed. We are (simply put) runners. The group is made up of the entire spectrum of runners: middle of the pack, Boston qualifiers, couch-to-5k-ers, first timers, run/walkers, age-group winners, trail runners, ultra runners, marathoners, half marathoners, ALL runners. We are a community made up of individuals going out and achieving their own dreams and walking their own path, but we are doing it together and celebrating the journey. 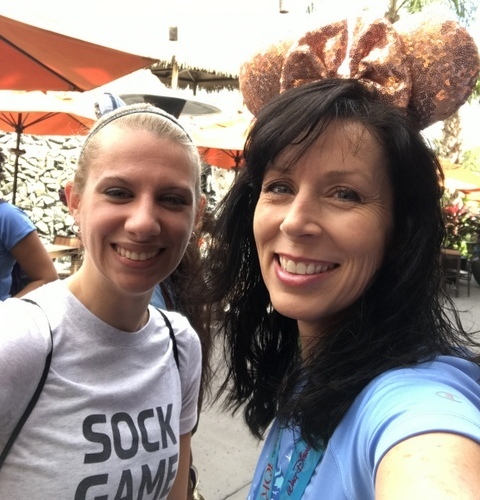 Since launching, there have been many #WeRunSocial meetups at runDisney events and while I was in California for the Tinker Bell Half Marathon, I was determined to go. Solo. But I have a little problem called Social Anxiety. Well, that’s not entirely true. 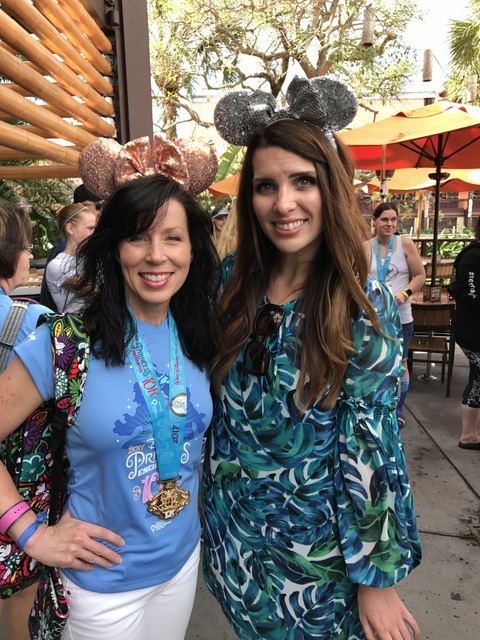 I’m a social gal at heart, but when it comes to meeting other bloggers and influences, I become frozen with a whopping case of Imnotworthyitis. 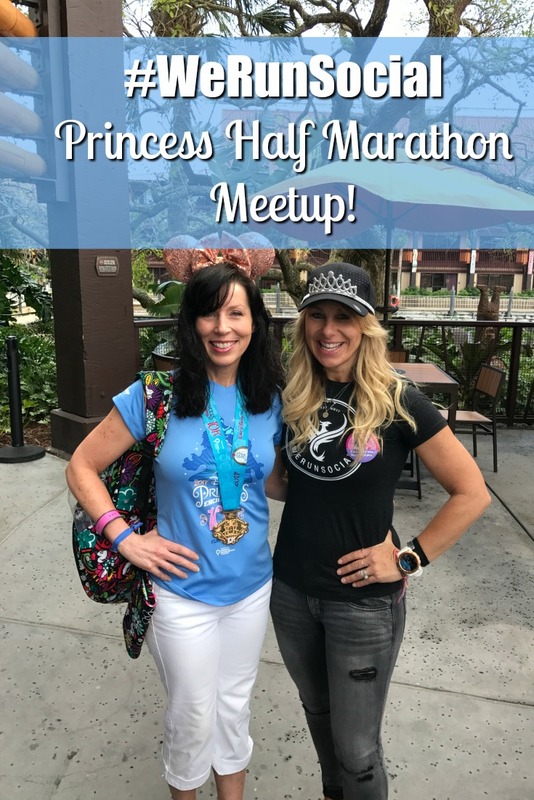 I touched on this in my Princess 10k recap, where I became a complete bundle of idiotic nerves while chatting with Julie and Patty, two very successful bloggers. So when I made it to Trader Sam’s in Downtown Disney for the Tinker Bell Meetup and saw a crowd of young social media mavens … none of which I knew … my anxiety rose to epic proportions and instead of stopping, I walked straight through the crowd and into the Disneyland Hotel where folks in the lobby looked at me oddly so I ducked into the bathroom where a woman washing her hands looked at me oddly so I went into a stall and forced myself to pee even though I didn’t have to go. Flash forward to the Disneyland Half Marathon in September. The four of us had good intentions to go to the #WeRunSocial meetup but we were having too much fun in the parks to leave. For the Princess meetup, however, I was determined to go. After all, I’m a blogger. And a YouTuber. Socializing with other bloggers and YouTubers is always a good thing. And I had a plan to also gather more channel content by filming others giving their best Princess Half Marathon tips for a future video. Sounds great, right? Well, yeah. Any guesses what happened? After the Princess 10k, I passed out in a sweaty, smelly heap and didn’t wake until 12:15pm. The meet-up was at 1:00. Shoot. So what did I do? Crawled back in bed and used this as an excuse to once again allow my anxiety and Imnotworthyitis to win. But then the guilt started to nag at me. I thought about how hard I work on this blog. I thought about how hard I work on the YouTube channel – scripting videos, filming content and spending hours editing, uploading, and promoting. 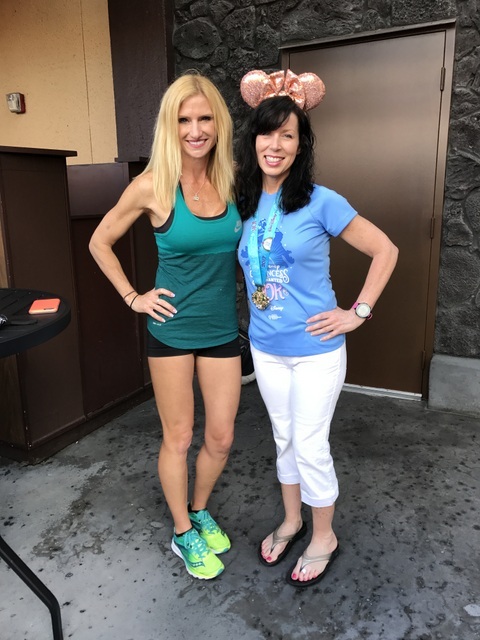 I work my rear off, so why in the world was I lying in bed when the opportunity to mingle with other like-minded runners was just a monorail ride away? So with that, I hauled my rear out of bed, went to the bathroom for the world’s fastest shower, and got dressed. 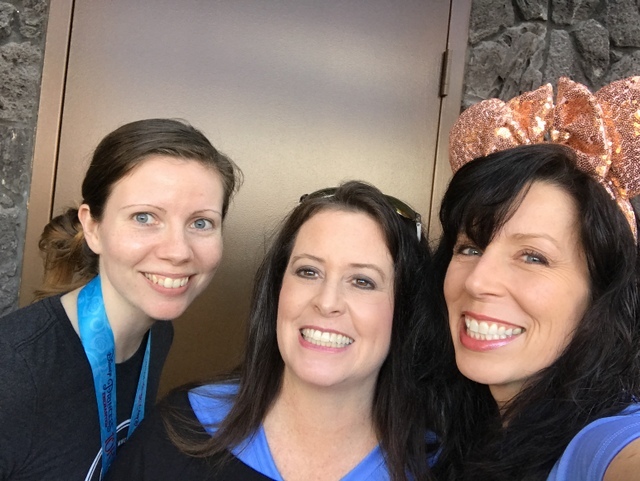 I almost backed out of wearing my brand-new rose gold Bibbidi Bobbidi Brooke ears … my skull still ached from the purple wig I had wore for the race, but when at Disney, one must wear ears, so I put them on. I was so uptight while traveling to the meet-up that I forgot to film for a video recap. And when I finally found Captain Crook’s outside patio area where, once again, a crowd of social media mavens were gathered … each of whom I was certain would take one look at me and think who the hell is that old woman … my inner Imnotworthyitis tripled, tempting me to just walk through the crowd and keep on going. Oh thank God. A conversation starter. Many thanks, Steffany Rubel from Run, Steff, Run!! We chatted a few minutes before I saw another familiar face, fellow YouTuber Kimberly Estabrook as well as her wonderful mother. It’s always lovely talking with them and we seriously need to get together in the future, but on that day, they had to leave soon for other Disney plans. Darn. She was glad to offer her best Princess tip … although this was when I discovered that the foam head on my microphone had fallen off and was nowhere to be found. And I couldn’t find my back-up ear buds. Argh!!! But in the spirit of carry on, she filmed her tip without it. Then I saw a familiar face and fellow Team Shenanigans fan, Christine from the Glass Slipper Chronicles blog! 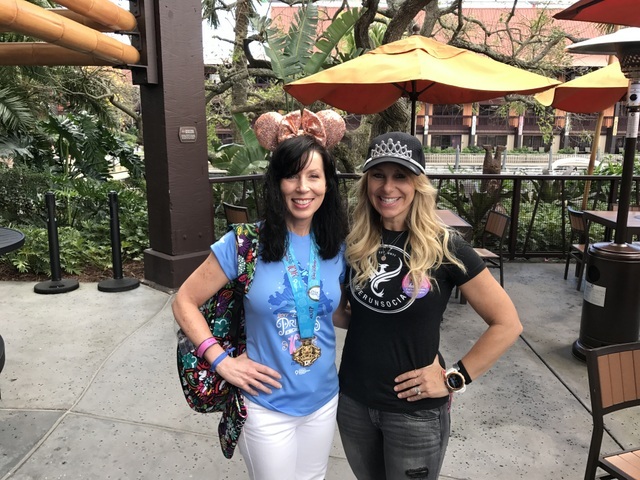 We then both met Pam Frost, another Shenaniganer and blogger at Wife, Mother, Runner! Once everyone left to continue socializing and I was on my own once again, the notion of bailing was very tempting … after all, change can happen in small steps, so I made myself a deal. I’d hang around long enough to meet two people: Pink Cupcake Girl, aka, Jen, and Heather Schulz, both of whom I greatly admire! At first, I was so intimidated by Heather … the woman is a power house! But two seconds into our conversation, I learned she’s lovely and humble. We chatted about running clothes and my need to carry everything with me on a long run, whereas she gets by with the bare minimum. I’m glad I had the chance to meet her, although I must admit to feeling very out of shape standing next to her! Next up on my must-meet list was Jen from Pink Cupcake Girl, who ended up being just as friendly and motivating and downright cool as her Instagram feed! We had a great conversation about YouTube and why I love it, making me super glad I approached her. I also got to meet Dani from @PastryChefDani and Ivie from @IvieAnne, who were co-hosting the meet-up with Jenn. I didn’t get a picture with either of them, but they did offer some great tips for my future video! So did several other bloggers and Instagram personalities as well as the gals from my room that I’ll soon put together in a video. But getting back to the meet-up. While I did have moments of bravery, there were still some folks that I didn’t approach but that’s okay. I did good and left feeling extremely happy about my decision to haul my rear out of bed and embrace this opportunity. See, here’s the thing about opportunities. You never know where they can lead you. While I didn’t receive any obvious perks from going to this event, I got to meet some great gals with kindred spirits and the desire to motivate others to improve their lives. Who knows, maybe one day I’ll collaborate with one of them. Or another opportunity will come my way as a result. 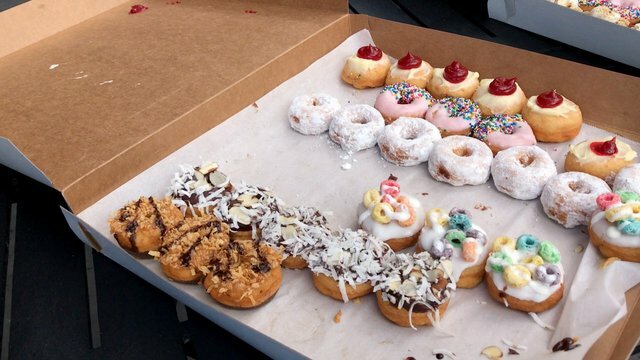 Donuts provided by Remi’s Minis! Click on the image to learn more. So if you are ever presented with a plateful of opportunity … whether big or small … TAKE THE PLATE. Get out of bed. Shower. Jump out of your comfort zone and embrace every chance you get to improve your life and reach your goals. Going to this event might not seem like a big deal to others, but it was major for me and I’m so glad I did. Otherwise, I wouldn’t be a part of this awesome picture collage from We Run Social’s Instagram account! So get out there and make things happen! Proud of you! I totally get it, I’m social as well, but it’s still intimidating going somewhere where you don’t REALLY know anyone (at least in real life), to socialize. Plus, I’m totally oblivious and never seem to recognize people, GAH! I wasn’t able to make this one, but hopefully Tinkerbell next month? ?